This latest fix ended up being a Thanksgiving fix! I received the box on Wednesday afternoon. I tried everything on (of course), but decided to wait until morning to take photos, because it was already getting dark! Anyway, this was a slightly rushed photo session (ignore the slightly damp hair), but I just couldn't wait to share everything! My stylist, Melanie, came through again! I got some great things! If you're reading this, there's a good chance you're familiar with Stitch Fix. If not, check out any of my previous reviews for a more detailed explanation of this awesome service! I have to admit - I felt a little strange wearing it during my Black Friday morning run to the store in Tucson (we needed extra maple syrup for multiple batches of blueberry pancakes!) It doesn't quite go with running pants and my NYC marathon shirt. I'll spare you the sight of that photo. Ha ha. Oh, well. I love the bag. It's MINE! Note - this is the second time that I have received a Kut From The Kloth item that has had conflicting item information on the packing slip and the item itself. The packing slip said "Jonathan". The tag on the pants said "Diana" . . . ??? Let's call them Jonathan-Diana pants, maybe? Anyway, here's my Thanksgiving outfit - I paired the teal skinnies with a cute top that I got from another service that I enjoy, Golden Tote! By the way, I wimped out on the leopard flats before we left for Tucson. I went with black instead. Now that I look at these photos, I think that was a mistake. Life is too short. Wear the leopard flats! I finally got a moto jacket! It's so soft! The arms are so long! I love it! It's a bit snug in the shoulders (and doesn't really zip comfortably), but it's also stretchy! It fits like my Kut From the Kloth denim jacket from my October fix, and I wear that all the time! Unfortunately, it has a broken snap. I really wanted to keep it, so I emailed Stitch Fix's customer service. On Thanksgiving Eve. Ha ha. I thought I might not hear back from them until Monday - imagine my surprise when I received a reply only an hour or two later! I was quite impressed with the customer service that I received on a holiday weekend! Great job, Stitch Fix! This is a beautiful shirt! The color is awesome - blue is my favorite! The fit/cut just didn't work for me. It's a flowy top, but it was very fitted in the top/shoulder area. It looked a bit too small, and just wasn't very flattering. The armholes were smaller than I would prefer. I got the feeling that they would have gotten irritating after a few hours. A top this expensive needs to be perfect . . . and it wasn't. Sigh. Look at the pretty lace detail on the back! Oh, well. It was a good choice! It is my style - it just didn't work! When I saw that I was getting a poncho, I tried to keep an open mind. In general, I prefer fitted clothing. Ponchos are usually . . . not fitted. However, I do have fun trying things out of my comfort zone now and then. 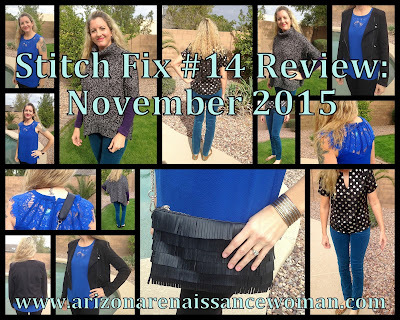 Stitch Fix is great for that! I have several things that I have purchased from Stitch Fix that I probably never would have tried on in a store. I always keep an open mind and try on everything in the box! Well . . . meh. I don't know. I liked the color. It's wasn't as baggy as I expected. The short sleeves, though! Hmmm. I think it would look silly without a shirt underneath it - especially with that cowl neck. The sleeves are on the tight side, as well. A fitted long-sleeved t-shirt would have been perfect to layer underneath it, but I don't really have any. I finally came up with one Lucky brand waffle knit shirt to put under it. Seriously, that's all I have! If I had some other options to wear under it, I might have considered keeping it. My husband thought it was cute. It just wasn't my thing. I decided to return it, and I updated my note to my stylist to indicate that I'm not a fan of cowl neck and turtleneck tops. I think it's important to do that - I've never said anything either way about ponchos, cowl necks, or turtlenecks, so why would I be surprised to receive something like this? I really thought this fix was a good one! I got to try something different (which I appreciated, even though it didn't work out,) and I loved the overall color profile. I received some colors in my last fix that I wasn't crazy about - I thought this one suited me much better! Since you are keeping three items, doesn't it make sense to keep all 5 and get the discount?